Get a grip with our soft and soothing real sheepskin steering wheel cover and eliminate that burning hot or freezing cold steering wheel. Remember how that leather or synthetic steering wheel cover got sticky after a few months use? These do not for they are sheepskin which contains lanlion. The lanlion kills bacteria keeping your wheel feeling fine. But if you are inclined to wash them, go right ahead, these covers are hand washable. Fits any 14" to 15" auto or truck steering wheel, which is almost all cars and trucks. Invisible elastic bands ensure a tight, non-slip fit on the steering wheel. In numerous colors to complement any interior. Excellent!! Love my new cover. Soft and warm on these wintry days. And will be cool on those hot summer days. The quality of this steering wheel cover is nothing but excellent. It fit our 2011 Ford Escape steering wheel perfectly and was easy to install. 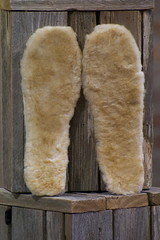 The sheepskin material and color (charcoal) was the best that could be imagined. Personal preference only is that it is a little bulky, but that's to be expected if you are looking for warmth. Perhaps the bulkiness with subside with use. Overall, we are very satisfied and it is a great value for the cost. Steering wheel cover was EXACTLY what I was looking for. Shipping was quick.